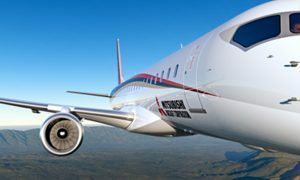 MRJ First Test Aircraft Completes Ferry Flight to the U.S.
Mitsubishi Aircraft Corporation and Mitsubishi Heavy Industries, Ltd. (MHI) today completed the ferry flight to the United States for the First Test Aircraft (FTA-1) of the MRJ (Mitsubishi Regional Jet), the next-generation regional jet. Mitsubishi Aircraft is committed to carrying out frequent, multiple flight tests in the U. S. to accelerate the development of the MRJ toward type certificate acquisition in 2018. FTA-1 took off from Nagoya Airfield at 1:28 pm on September 26 (JST), and arrived at Grant County International Airport in Washington, the U.S. at 9:44am on September 29 (JST) (5:44pm on September 28 in local time). Mitsubishi Aircraft and MHI remain committed to achieving steady progress in flight tests with the assistance of three engineering bases (Moses Lake Flight Test Center, the MRJ flight test center within Grant County International Airport; Seattle Engineering Center and Mitsubishi Aircraft Headquarters in Japan) working together toward the success of the MRJ project.